We are very lucky to live close to such a beautiful coastline and I love to go for a stroll as often as we can. 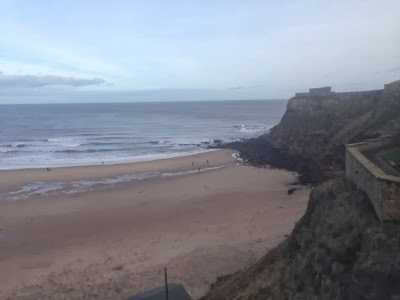 I love the rugged coastline of Northumberland the best but a close second is Tynemouth. We always dream that one day we will retire in Tynemouth, even though it's very unlikely to happen unless we win the lottery! I just love the place. It is full of quirky shops, little bistros, delis, bakeries, coffee houses and tapas bars. 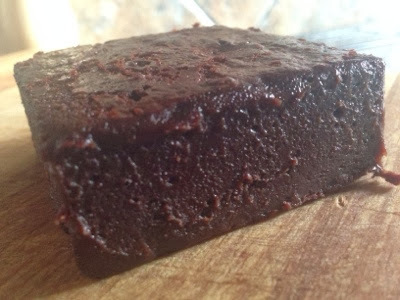 I also just love the Gareth James chocolate shop and their brownies are the best you will ever taste! 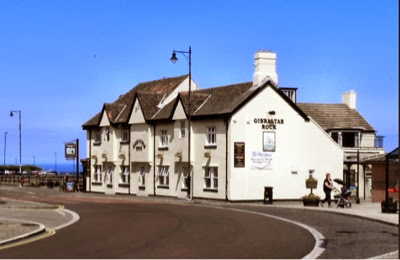 The Gibralter rock is a gem of a pub, situated in a prime position in the heart of Tynemouth overlooking King Edward's bay. It is the perfect place to enjoy a pint of beer or a meal after a stroll along the beach or browsing around the shops. The menu is varied and can be viewed here - Gibralter Rock menu. 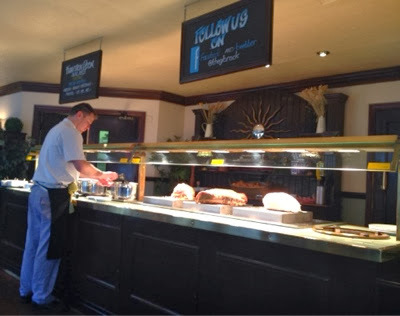 Most people would find it hard to look any further than the 2 for £10 carvery deal (All day Mon-Sat exc. bank hols) which is a complete bargain! I work all day on a Sunday so when I go out for a carvery, I like to make sure it's a good one. We weren't disappointed with The Gibralter Rock's offering. There were 3 meats to choose from (turkey, beef and gammon) and they all looked tender and moist. I decided on beef and the chef carved me a very generous portion - in fact it covered the whole of my plate. It was so lovely and had obviously been slow cooked. It just melted in my mouth! Hubby really wanted to make the most of his meal and asked for 2 slices of each type of meat! The chef happily obliged with not even a raised eyebrow! We were given a homemade yorkshire each too. You can then help yourself to veg - the veg here hasn't just been boiled in mass and thrown in a serving dish. Thought has been put into the process. There were carrots, cabbage, parsnips, broccoli and both boiled and roasted potatoes. 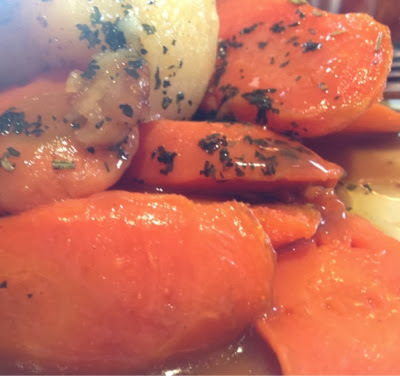 The carrots and parsnips were gorgeous and tasted as if they had a slight honey glaze. 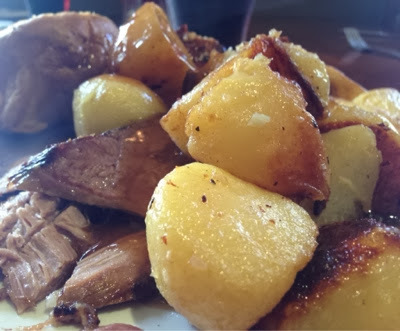 The roast potatoes were homemade - crispy on the outside and fluffy on the inside, just as they should be and absolutely amazing. There were sauces and lots of gravy to help yourself too as well and you are given an individual tray to carry your plate back to the table which makes the job a lot easier! Children are well catered for too. There were quite a few babies happily sitting in highchairs and enjoying little pieces from their parents plates. 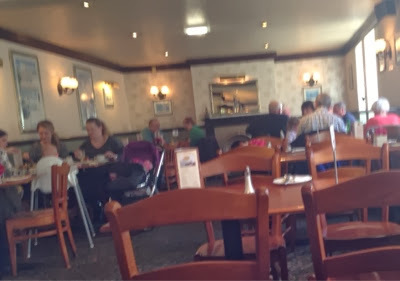 You can choose a child's main course, ice cream and a drink for £5 which is an excellent price considering the location. 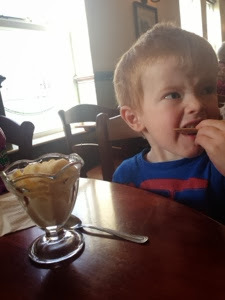 Our 3 year old wanted fish fingers (I was trying to convince him to have a carvery but he was having none of it). I'm very pleased that the chips looked homemade. I hate it when children's meals aren't given as much thought as an adult meal. Not the case here! The atmosphere at the Gibralter rock is very homely - the service is friendly and nothing is too much trouble. The staff are very obliging to any requests and although they are busy they will always go out of their way to help. There is a traditional desserts cabinet standing proudly in the centre of the room featuring stunning homemade cakes and desserts. An amazing looking chocolate cake and a raspberry pavlova were very very tempting! We just had no room for dessert! Must remember not to fill up on so many delicious roast potatoes next time. Next time you fancy a stroll along the coast, be sure to work up an appetite and call into The Gibralter Rock, if you are lucky you may even manage to be seated by one of the windows which boast fabulous views over the coastline. It is so important to support our independant homely restaurants and pubs and stop the bland big boy carvery chains taking over! 2 carveries for £10, 2 large cokes and a child's meal was just under £20. Bargain!